The National Alliance of Concurrent Enrollment Partnerships » What is Concurrrent Enrollment? Concurrent and dual enrollment partnerships provide high school students the opportunity to take college credit-bearing courses. NACEP defines concurrent enrollment as the subset of dual enrollment courses taught by college-approved high school teachers. Concurrent and dual enrollment partnerships and early college programs successfully transition students from high school to college. Concurrent enrollment is a low-cost, scalable model for bringing college courses to students in urban, suburban, and rural high schools and secondary career centers. Students gain exposure to the academic challenges of college while in their supportive high school environment, earning transcripted college credit at the time they successfully pass the course. Sometimes called “dual credit,” “dual enrollment,” “college in the high school,” or “early college,” concurrent enrollment differs from other models of dual enrollment because high school instructors teach the college courses. A high school student travels to the college campus. College faculty travel to the high school or secondary career center. A high school student takes a course from a college instructor via distance education, either synchronous via interactive video or an asynchronous online platform. Articulated credit is provided when an individual college retroactively assigns credit for high school coursework upon matriculation. In concurrent and dual enrollment courses, students receive a transcript based on performance in a college course. Advanced Placement, International Baccalaureate, and Project Lead the Way are advanced high school courses where standardized tests are used to assess students’ knowledge at the end of a course. Some colleges and universities will place students out of entry-level courses and/or provide credit-by-exam based on students' performance on these exams. Concurrent and dual enrollment courses are actual credit-bearing college courses. Concurrent and dual enrollment students earn a college grade based on multiple and varied assessments throughout a course, not just from one high-stakes test. 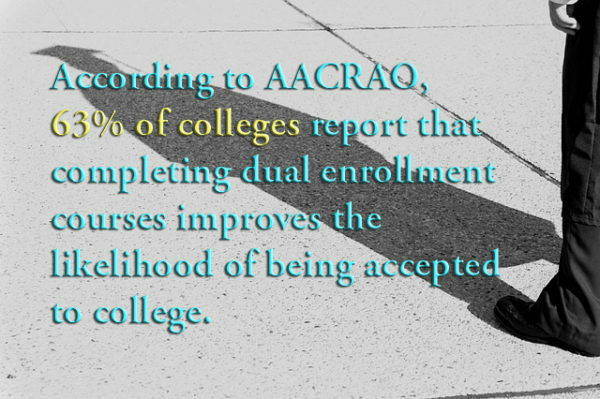 Concurrent and dual enrollment students earn transcripted college credit at the time they successfully pass the course, not retroactively for prior learning.